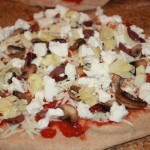 Pizza dough is one of those things that seems to be very difficult but it actually extremely easy to make from scratch. From start to finish, a pizza dough won’t take you more than 5 minutes to prepare and an hour to let rise. When PB and I started our long distance lovefest we would have pizza every single Friday night. 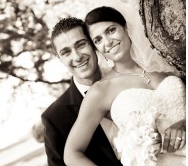 I remember calling him from my plane to tell him to get the oven on, and I remember at least 10 occasions when I arrived to his place to find the dough ready, the oven hot, and the salad made. At first we used pre-made pizza crusts, canned pizza sauce, and shredded mozzarella. Over time we developed our favorite pizza dough recipes (white dough recipe coming soon, half whole wheat here) and began to use local fresh mozzarella, San Marzano tomatoes, and lots of oregano. 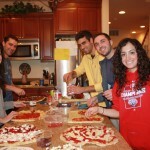 We love having pizza nights, but it is even more fun with friends! 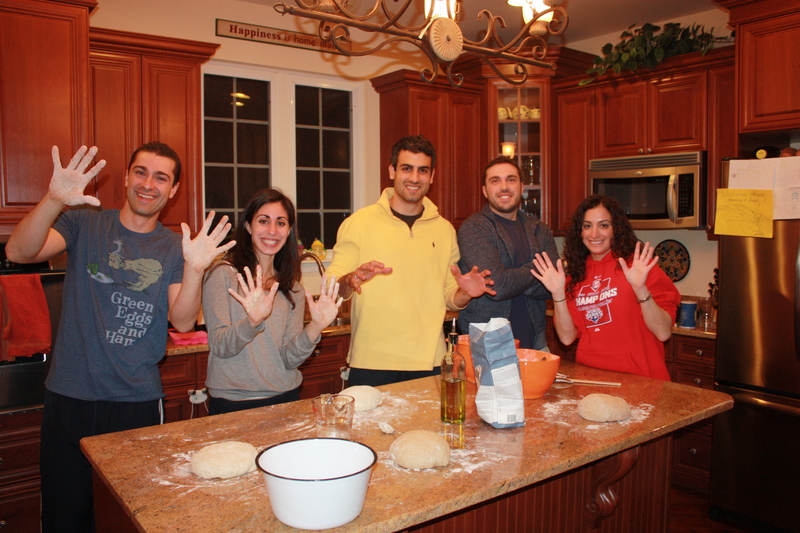 Saturday night we headed over to Garo & Tamar’s house with Kristine & Jon for a pizza lesson. Everyone brought some ingredients, and PhillyBoy gave the lesson, with a few interjections from me on the 1/2 whole wheat adjustments. Although we are all good cooks, PB is the master pizza dough maker. He knows how to prepare a batch just right so that the dough is crunchy, chewy, and perfect. We made 4 big batches of dough and packed some up right away to take home with us. For dinner we made several pizzas, some with the white flour crust and some with the 1/2 whole wheat. Of course my favorite pizza of the evening was the one I constructed with artichoke hearts, mushrooms, and kalamata olives on the wheat crust. 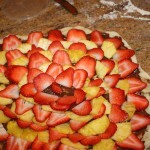 Tamar had the genius idea of making a dessert pizza with Nutella, strawberries, and pineapple that was incredible. I want to make this again sometime! I picture making it in mini rounds with one single slice of strawberry (excellently sliced by Garo, who apparently is a master fruit designer?). 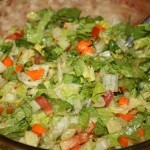 Tamar also made a delicious chopped salad that was a refreshing change from the cheesy pizza. It was so fresh! The evening was so much fun. It started with smiles, laughs, and inappropriate dinner table discussions and ended with the same. I love our friends, I love pizza, and I love dates. It was a perfect evening…. even if I had to be rolled home. Also, check out Chelsea’s photos from the Frog Hollow Farms’ First Annual Blossom Festival! I wish I lived in California sometimes. The dessert pizza looks delicious! anything that includes pizza & sweatpants in a win in my book! 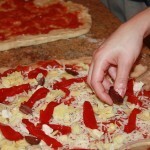 Make-your-own pizza sounds like such a great idea for a party! Great minds think alike 🙂 PB’s pizza dough always looks SO delicious when I see it on your blog! I think I’ll just stick with the regular yeast next time. In the past I’ve only ever used regular yeast, but I figured I’d try the instant since both the recipes I looked at called for it. I think I’ll have to try out your recipe next!! I love that you love to entertain too! And you are definitely second to none. I love reading your menu’s and planning, everything is so thought out and organized. Not to mention delicious! oh yeah and to answer your question about the parchment… No wax in it, I just used Reynolds Parchment Paper. Didnt stick to the crust or the stone and still got nice and crisp! It made the whole process SO much easier…just slides in and out off the stone. I was a little skeptical at first too, but after a little googling turns out it’s pretty common to use with pizza stones. Looks awesome! 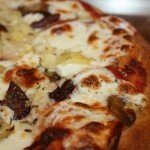 Home made pizza is great and I usually just grab some pizza dough from a local pizzeria in the area. Live right outside Philly so the dough is usually top notch! Looks like a fun evening and the pizza looks delicious. I’m going to have to make a dessert pizza some day, what a great idea. That sounds like such a fun. I love how your group of friends are really into food! What a perfect time, I love it (and sweatpants…a lot!)!! So true, pizza dough is not hard to make and makes the pizza SO much better! Hey..I would love to make the dessert pizza for Easter..is the dough just regular white dough or is it sweet in anyway? Would you recommend do the 1/2 wheat for that? @Brittany, Hi Brittany! I am not sure which dough this was, but honestly either one would work nicely! It is regular pizza dough. We sprinkled it with cinnamon and sugar and then added the Nutella and fruit. 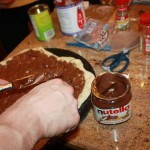 If I were to make it again I would cook the dough with just the cinnamon and sugar and then add the nutella and fruit right out of the oven. The nutella would still get all melty, but the fruit would stay cold and crisp, the way I like it. Then again, it is personal preference of course! Let me know how it comes out, and thanks for reading!